The Advisory subcommittee on planning and regulation met at 6:00 pm on Thursday, April 9, in the third-floor employees’ room at Town Hall. All the current subcommittee members were on hand: Stanley Spiegel of Precinct 2, the chair, Angela Hyatt of Precinct 5, Steven Kanes of Carlton St., not a town meeting member, and Lee Selwyn of Precinct 13. The agenda was resolution articles about changing Chapter 40B standards for housing projects [Article 17 in the spring warrant] and about a study of acquiring land for park and recreation uses in the Putterham neighborhoods of south Brookline [Article 18]. The subcommittee was unable to complete a review of Article 17 and will convene again after petitioners–led by Nancy Heller of Precinct 8, a former School Committee member and a candidate for Board of Selectmen–meet with members of the Housing Advisory Board about strategy for the topic. Article 18 was explored at length with its petitioners–led by Regina Frawley, a Precinct 16 town meeting member–and with town staff. Article 18: Ms. Frawley and Hugh Mattison, a Precinct 5 town meeting member, made the case for Article 18. Responding to questions were Joslin Murphy, the town counsel, Gary McCabe, the chief assessor, and Alison Steinfeld, the planning director. The hearing attracted an audience of about ten, including Patricia Connors, a Precinct 3 town meeting member, Rebecca Plaut Mautner of Precinct 11, Fred Levitan of Precinct 14, Saralynn Allaire of Precinct 16, Stephen Chiumenti of Precinct 16, and Brookline residents Barbara Sherman, Perry Stoll and Jim Salverson. 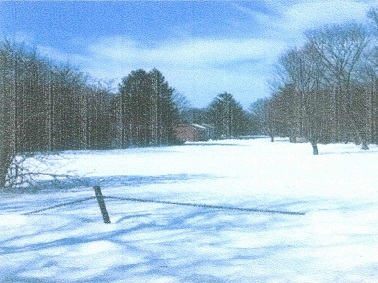 Article 18 proposes a resolution asking the Board of Selectmen to conduct a study about acquiring so-called “buffer” parts of Hancock Village, in south Brookline, by eminent domain for park and recreation uses. Those are strips of land about 30 to 80 ft wide, bordering single-family houses mostly along Beverly Rd. and Russett Rd. They were configured when Hancock Village was rezoned and designed in the mid-1940s. As Ms. Frawley described, Brookline has previously acquired park land by eminent domain, starting in 1871 with Cypress Playground, as it is known today. More recently, in the 1970s, Brookline acquired Hall’s Pond and an adjacent parcel off Amory St. by eminent domain, for conservation purposes. In between, there were other additions to the town’s open space–by bequest, agreement, purchase and eminent domain. In the Putterham neighborhoods, Ms. Frawley argued, there is little public open space. During the years of the Great Depression, when much development in those neighborhoods was underway, Brookline did not acquire park and playground land, as it had done earlier in other parts of town. She reviewed the current public open spaces and showed that the Hancock Village buffers look to be the largest undeveloped areas likely to be eligible. Hancock Village buffers: The buffers can be identified from a Brookline atlas or zoning map as located in a single-family rather than a multiple-apartment zone. Brookline’s town meeting, following a 1946 zoning agreement between the John Hancock Mutual Life Insurance Co. and the Town of Brookline, rezoned adjacent areas toward the southwest, now built as garden-village style housing, to multifamily 4C and left the buffers zoned as single-family 7D, the same as the adjacent house lots along Beverly Rd. and Russett Rd. In 1962, Brookline changed from its classic to its modern zoning identifiers, making 7D into S-7 and making 4C at Hancock Village into M-0.5, with about the same restrictions. Before then and since, there have been actual and attempted incursions into Hancock Village buffers. The Russett-side buffer is penetrated by Thornton Rd., connecting with Grassmere Rd. Its northern tip skirts three houses addressed on Independence Dr., reducing the minimum width there to about 30 ft. In the 1950s the John Hancock Co. applied to build parking lots on the buffers, and in the 1960s a subsequent owner, the Niles Co., applied similarly. Those would have been variance uses, not allowed under single-family zoning, and both were denied by Brookline’s Board of Zoning Appeals on grounds that a hardship to the owners had not been shown, as required by state law. Records of decision for those cases do not mention the 1946 zoning agreement, and that agreement does not mention the buffers. Town-meeting proposal: Putting on their finance hats, subcommittee members asked about the potential cost to acquire the Hancock Village buffers. Mr. McCabe, the chief assessor, described a process for determining value, but the only number he could cite was the average land value currently assessed for all of Hancock Village, about $1.15 million per acre. The 1946 agreement specified that Hancock Village is restricted to “high-grade garden village type” housing. How much more of such housing could be built on the buffers, if there were no other restrictions, is not known. That might provide an upper limit on their land value. Garden-village apartments at Hancock Village are arranged in spacious chains, with views of landscaping. It is not clear whether any such housing could be situated in the relatively narrow buffers. Their land value could be minimal. Perhaps the town might do the owners of the land a favor by taking it off their hands, since they would not have to mow the grass any more. The subcommittee was favorably inclined to a study of the issues and voted unanimously to recommend approval of Article 18. This entry was posted in Environment, History, Meetings, Neighborhoods, People, Services on April 10, 2015 by Craig Bolon.